Google's predictive search terms for education in America reveal a disturbing problem with how this country attempts to teach children how and what to learn. Standard education in America typically focuses on creating a supply of worker bees who follow orders from authority and operate within the confines that the system has set out, but lack critical thinking skills. The results of such a system which suppresses and discourages creativity and imagination appear to be having a detrimental effect on children. “Education” in America has become so mundane and depressing that Google’s frequently searched terms are populated with the bleakest possible outlook for it. 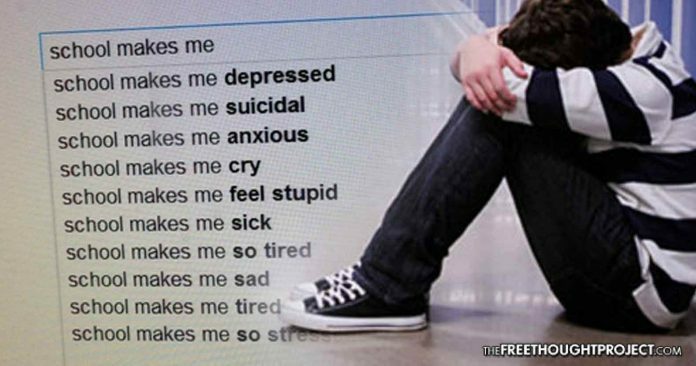 School makes me: depressed, suicidal, anxious, cry, feel stupid, sick, stressed. Obviously, this is not what parents want for their children. However, because of the rigid and bureaucratic nature of public education, it is exactly what they are getting. One of the most viewed Ted talks of all time was given by Sir Ken Robinson in 2006, where he explained how traditional education virtually kills creativity. Indeed, his claims were recently backed up by a NASA study which set out to find the most creative kids in the country and accidentally discovered that the education system is destroying children. Upon entry into the school system, those numbers started to drop—dramatically. When the team returned to test those same subjects at age 10, the percentage of genius-level imaginative and innovative thinkers fell to an unthinkable 30 percent. The indicators led the researchers to believe the current educational system is to blame. Not only did 68 percent of those students lose their ability to think with imagination and innovation, the thought that only 30 percent could still do is unfathomable. When children are forced into worker drone factories every day and all taught the exact same thing and society tells them if they fail to memorize this way of thinking they will not succeed in life—it is no wonder they feel depressed and anxious when talking about school. With standard education failing many in society, people are increasingly turning to homeschooling in an effort to fulfill their children’s educational potential. Currently, only about 3.4% of children ages 5 – 17 are homeschooled in the United States, but studies have shown that homeschooled children typically outperform their peers from both private and public schools. When conformity and rigidity are replaced with free thinking and innovation, the results can be quite stunning. Such was the case with 13-year-old Logan LaPlante, who left the public education system for a homeschooling program specifically tailored to his interests. In a viral Tedx talk, Logan explains how he has hacked his education to work toward his goals and take true ownership of his destiny. Society would do well to heed the advice of this brilliant child.